This retail showcase, glass cabinet features a frameless glass design with a black melamine storage cabinet at the bottom. 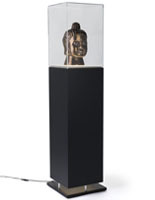 You can showcase your most valuable items at the top while storing additional items below. 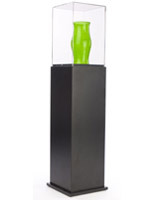 We manufacture this glass cabinet from tempered glass that is 6mm in thickness for safety purposes. Tempered glass, when broken, breaks into smaller, more manageable pieces than standard annealed glass. 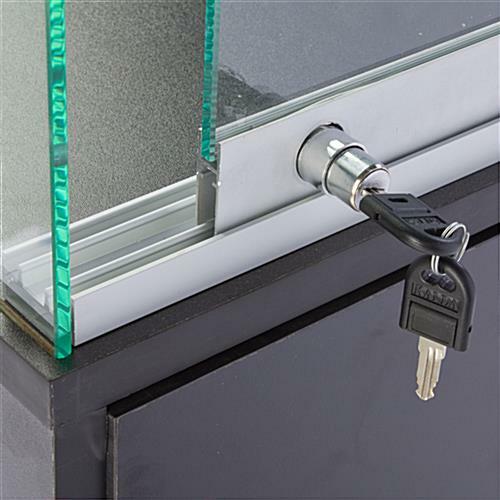 As a result of the frameless construction, items can be viewed from every angle with ease. This display case can be used as part of a configuration to create an entire retail store design or individually, right in the center of your store or museum, showcasing items for all to see. 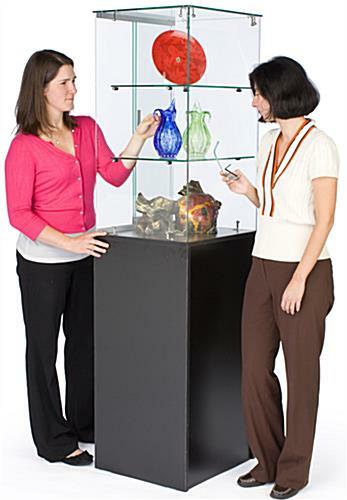 A glass cabinet, like curio displays and display cases, is perfect for use in any business. 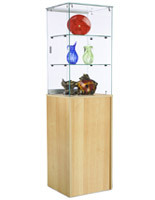 This tower case can be used in museums, gift shops and retail stores for displaying any best selling or new products. 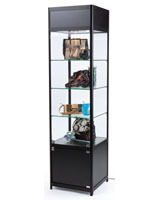 This type of cabinet is ideal for displaying jewelry, eyewear or even electronics. Its contemporary styling is perfect for drawing customer attention! The versatile design of this display case also allows you to use it at home for displaying valuable collectibles as well. Though the two included glass shelves are not height adjustable, you can remove the shelves easily to accommodate larger products. 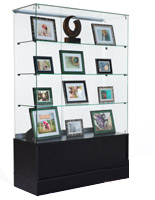 A display case, glass cabinet provides an ideal way to keep any valuable or expensive items safe and free from dust! 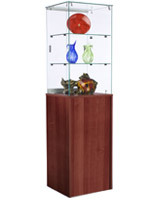 This retail showcase, glass cabinet is shipped to customers unassembled to save you money on shipping costs. However, detailed instruction sheets are included for your convenience. 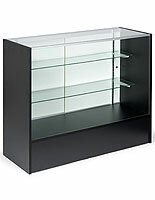 Complete the look of your retail store by adding this display case to your store configuration today! I had purchased a larger display earlier last month and was hoping this smaller one would be as fabulous. Unfortunately, this item was not protected well in shipping (which was very expensive) and there are parts missing and a few dings in the bottom cabinet. So far we have spent about 3 hours in assembly. 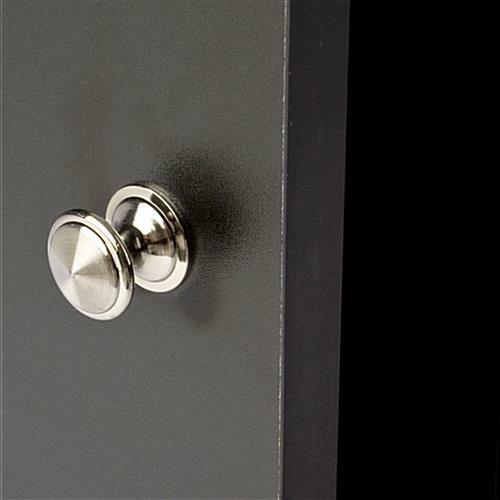 This locking cabinet was purchased to hold some very expensive eyewear, so currently disappointed in the quality. We are sorry to hear that you have had problems with damage in shipment and assembly. A customer care specialist will reach out to you shortly to assist you with this. Thank you. After seeing this item listed as "NEW" on your site I ordered two of them. And though one of them was completely untouched inside we knew that it was new & unopened but the other was obviously refurbished because a few of the pieces were already attached inside the box?? While we do not refurbish or sell used products, we will still have a customer care representative reach out to you shortly to see if there is anything we can assist with.